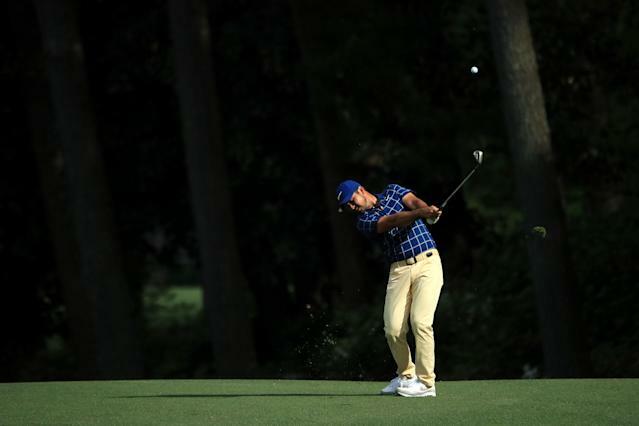 AUGUSTA, Ga. — Jason Day has a bad back. Sometimes it takes him 10 minutes to get out of bed. Sometimes he says he feels 70 years old. Sometimes, like Thursday, he can knock it out of whack by simply bending over and trying to kiss his 3-year-old daughter, Lucy. The last one occurred on the Augusta National practice green Thursday, just minutes before Day was supposed to begin his opening round at the Masters. He told his caddie he might have to withdraw. Instead, the back softened up enough that he was able to hobble and fight through the round, posting a two-under 70. After a night of ice and treatment and rest, he woke up Friday and couldn’t move. He said he took a bath to try to loosen things up. It wasn’t working. “I was kind of moping a little bit,” Day said. Then his wife, Ellie, came in to check on him. By mid-afternoon Day had sucked it up enough to card six birdies en route to a 67 and a share of the lead (with four others) at 7-under. Bad back and all. All of the above is true, but Day hit a little white golf ball on Friday about as well as anyone can. How he is managing that with what he basically described as crippling back pain is anyone’s guess — although a chiropractor, painkillers and all sorts of oddball techniques are involved. The strangest one? Well, there is the technique where he lays on his back and blows into balloons in an effort to “move” his ribcage back into place. “It sounds very insane when you're sitting there,” Day said. “I flew down to Florida this last week, and I met my trainer, and we're in the pilot's lounge of this [private terminal], and there's two pilots, you know, sitting next to me. I'm laying on the ground and they are sitting there, and I'm blowing these balloons up. Anyone who has ever experienced back pain, let alone serious back pain, knows the search for relief is often elusive, frustrating and temporary. Day is grateful for making it through Thursday and Friday, but he’s too experienced at this to get overconfident. The 31-year-old Australian has been dealing with back pain since he was 13, which is not an ideal situation for someone whose career requires him to repeatedly, and violently, swing a club. The pain doesn’t just affect his game, it affects everything. He said that on Thursday afternoon he wanted to play with his children and distract himself from the pressure of the Masters, but instead he was relegated to icing his back in bed. “Emotions go up and down,” Day said. “Sometimes you can be down and depressed because it feels like your world is kind of crumbling around you, and you don't know if you can come back from injuries, whether it's a thumb injury or back injury or wrist or knees. Day has tried to turn it into a positive. He said when his back is flaring up and he isn’t sure he can even play, he lets the pressure of trying to win fade away. Health can put everything into perspective. “Sometimes I've just got to take myself a lot less seriously and know that I have a good family and I've got good support around me, and that golf sometimes is not the thing that shapes me,” he said. He’s expected to tee it up on Saturday … at the top of the Masters leaderboard, bad back and all.